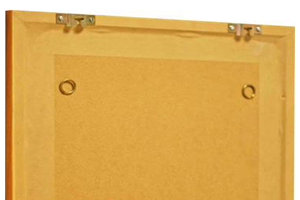 From Archival tape to Z Clips, when it comes to the back of the picture frame we stock a huge range of product. For your gallery/workshop we have all the fittings you are ever likely to use. We also stock a comprehensive range of knives and blades that are constantly used in any framers workshop. 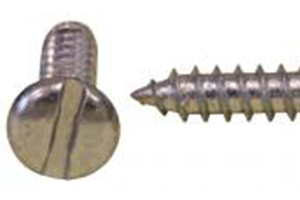 For those jobs that need a little extra protection we stock the Springlock range of security fixings. For retail displays we have a complete Blister Pack Stand that you can use to sell fittings to the customer. 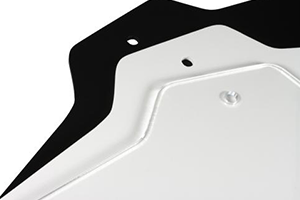 Our range of tapes includes various backing tapes, double sided tapes and archival tapes as well as several dispensers. 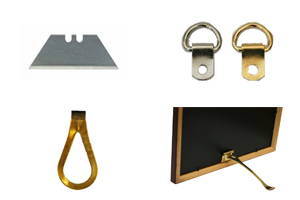 A range of fixings for mounting those unusual items that need to be framed. This unique security fixing is almost invisible once the picture is hung. 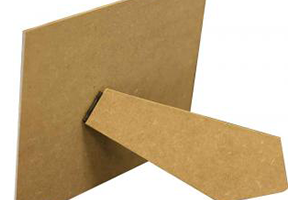 A simple alternative to hanging a picture, ideal for photo frames. But which screw or pin?